Carbon Monoxide Alarm Going Off Every 30 Seconds – What To Check? My CO alarm keeps chirping every 30 seconds. We replaced the battery but it keeps beeping. How many beeps indicate a CO leak? Can I reset the alarm? It’s a Kiddie brand CO alarm and about 8 years old. How do we stop it from going off? There are 3 reasons a Carbon Monoxide (CO) Alarm will beep every 30 seconds. 1. Battery needs to be replaced. 2. Alarm has reached end of life. 4 loud beeps = Indicates carbon monoxide. Beeps every 30 seconds = Indicate low battery or end of life. Long continuous beeping = Indicates alarm has been unplugged. A carbon monoxide alarm can be reset by pressing the “RESET” button that is located on the alarm. If after resetting the alarm it keeps chirping, replace the batteries and test the unit. The alarm may have a low battery when it beeps. Replace the batteries when the unit beeps every 30 seconds. Turn the unit counterclockwise to remove it and remove the old batteries. Install the new batteries into the alarm. Press the reset button after replacing the batteries if the alarm still sounds. 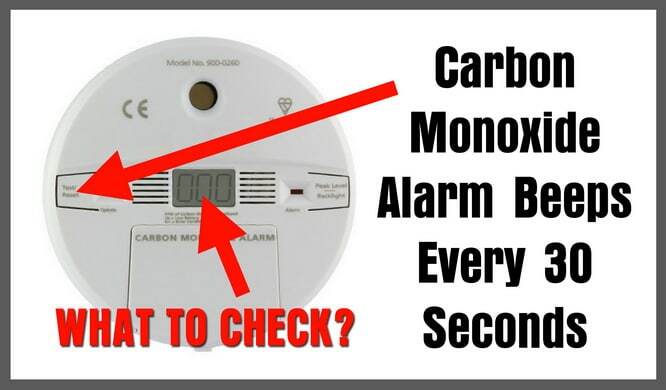 If the alarm keeps beeping after replacing the batteries, you may have carbon monoxide present. CO alarm batteries are 9 volt, AA, or AAA batteries. If the carbon monoxide alarm senses a high level of carbon monoxide, you will hear a loud 4 beep pattern. The alarm sound is 4 short beeps with 5 seconds of silence. 4 beeps – 5 seconds silence – 4 beeps – 5 seconds silence – etc. This indicates a true carbon monoxide alarm and further action needs to be taken for your safety. Move to fresh air if you suspect carbon monoxide to be present. When your carbon monoxide alarm reaches its end of life, the alarm will beep every 30 seconds to inform you the alarm unit needs to be replaced. The alarm will beep after 7 to 10 years of use. This 30 second beep is similar to a low battery alarm. To know if the unit is at end of life, replace batteries first. If 30 second beeping still occurs, replace the alarm unit. NOTE: Replacing the battery when the unit is at END OF LIFE will not stop the beeping. What does “ERR” mean on carbon monoxide alarm? “Err” indicates an error has occured. This can mean the alarm has encountered an error or a power surge and needs to be reset. Press and hold the reset button. “ERR” can also show when the CO alarm is at its end of life. A CO alarm that has reached end of life needs to be removed and replaced. What does “END” mean on carbon monoxide alarm? CO alarms with a digital display will show “END” in the display to inform you the alarm has reached its END OF LIFE. Remove and replace the alarm when you see “END” on the digital display. What does “Lb” mean on carbon monoxide alarm? The “LB” code on your CO alarm simply means that the battery is low and needs to be replaced. What items or appliances can cause carbon monoxide in a home? Need help with your carbon monoxide alarm? Please leave a comment below and we can assist.